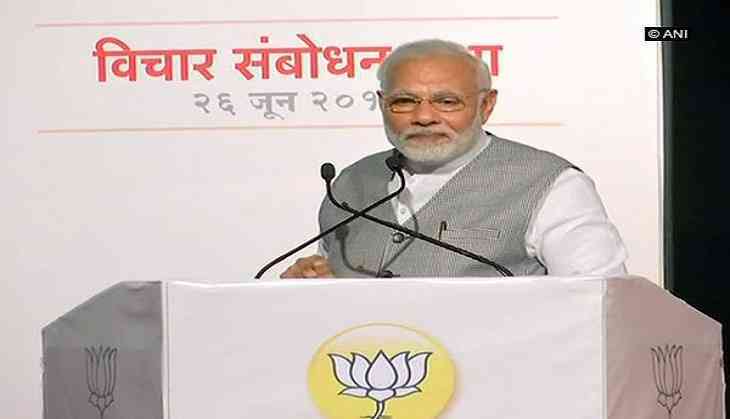 Prime Minister Narendra Modi on Tuesday said the government is firmly committed to the path of fiscal consolidation. "The Government is firmly committed to the path of fiscal consolidation. Government debt as a percentage of GDP is consistently declining. India has achieved a rating upgrade after a long wait," he said while addressing the third annual meeting of the China-led Asian Infrastructure Investment Bank (AIIB). "India is one of the most investor-friendly economies in the world. Investors look for growth and macroeconomic stability. They want political stability and a supportive regulatory framework to ensure the protection of their investment. Our macroeconomic fundamentals are strong with stable prices, a robust external sector and a fiscal situation firmly in control. Despite rising oil prices, inflation is within the mandated range," he added. Prime Minister Modi further asserted that India and the AIIB would work towards making economic growth in India more inclusive and sustainable. "In India, we are applying novel Public Private Partnership models, Infrastructure Debt Funds, and Infrastructure Investment Trusts to fund infrastructure," he added. Prime Minister Modi also hailed India's macroeconomic fundamentals, robust external sector and stable fiscal situation, adding that these have ensured al;l parameters remain within range, despite extreme conditions. He further hailed New India as one that stands on the pillars of "economic opportunity for all, knowledge economy, holistic development, and futuristic, resilient and digital infrastructure." "The Indian story of economic resurgence closely mirrors that of many other parts of Asia. The continent finds itself at the centre of global economic activity and has become the growth engine of the world. In fact, we are now living through what many term as the 'Asian Century'," he added. On a related note, the theme for this year's AIIB meeting is "Mobilizing Finance for Infrastructure: Innovation and Collaboration." Leaders from varied organisations and levels of government will be sharing ideas and experiences for creating a sustainable future through sound infrastructure investment.